Insulin and glucagon are two types of hormones responsible for the maintenance of glucose levels in the blood. Glucose is one of the vital sources of energy. It circulates through blood and is taken up by the metabolizing cells of the body. Both enzymes are secreted by the pancreas. The main difference between insulin and glucagon is that insulin increases the glucose uptake by the body cells from the blood whereas glucagon releases glucose from the liver and muscle cells into the blood. This means insulin decreases the blood glucose levels while glucagon increases the blood glucose level. Insulin is a hormone produced by β cells of the pancreas. It decreases the glucose levels in the blood. The stimulus that induces the secretion of insulin is the high glucose concentrations in the blood. Once the glucose concentration comes to the normal level, the levels of insulin in the blood are also reduced. The normal level of glucose in the blood is 70 to 100 mg/dL. The influence of insulin on glucose is shown in figure 1. Insulin affects the cells of the body such as skeletal muscle cells, liver cells, and fat cells. Insulin stimulates these cells to take the glucose from the blood. This reduces the blood glucose levels. 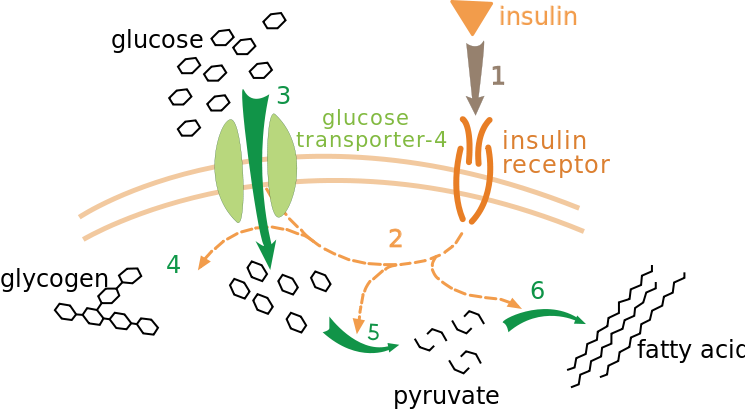 Inside the cells, the catabolism and the storage of glucose are also induced by insulin. Glycogenesis is the synthesis of glycogen from glucose in the liver. Insulin stimulates the synthesis of triglycerides from free fatty acids. When the glucose levels are high in the blood, the secretion of glucagon is inhibited. Insulin deficiency causes both type 1 and type 2 diabetes. Glucagon is a hormone produced in α cells of the pancreas and stimulates the breakdown of glycogen. The stimulus that induces the secretion of glucagon from the pancreas is the low concentration of glucose in the blood. Blood glucose levels can be decreased between meals and during exercise. The action of glucagon is shown in figure 2. Glucagon mostly affects liver cells. It releases glucose from glycogen into the bloodstream. The process of breaking down glycogen in the liver is referred to as glycogenolysis. 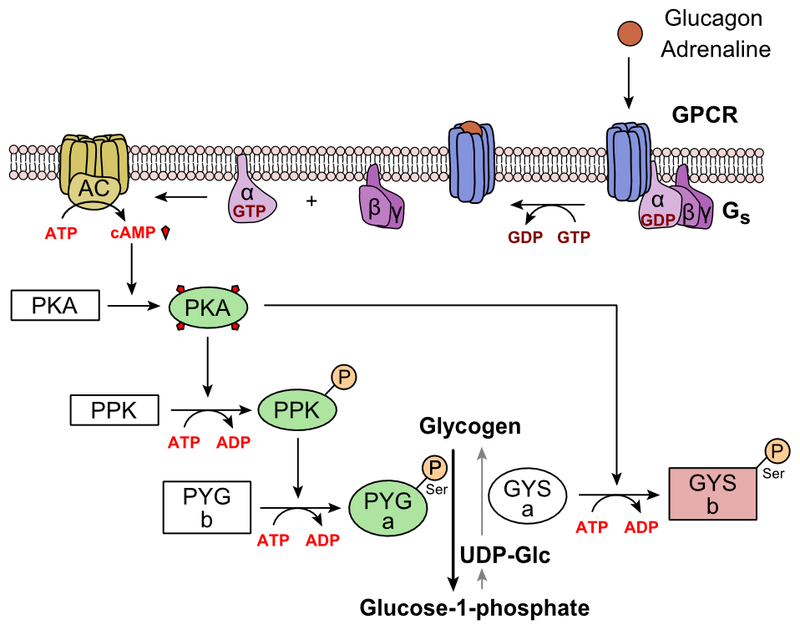 Glucagon stimulates the synthesis of glucose from non-carbohydrate carbon substrate such as amino acids in gluconeogenesis. Glucagon deficiency causes hypoglycemia and glucagonoma. Both insulin and glucagon are two hormones that regulate blood glucose levels. Both insulin and glucagon are secreted by the pancreas. Both insulin and glucagon are peptide hormones. Insulin: Insulin is a hormone produced by β cells of the pancreas and decreases the glucose levels in the blood. Glucagon: Glucagon is a hormone produced in the α cells of the pancreas and stimulates the breakdown of glycogen. Insulin: Insulin is secreted by the red color β islet cells of the pancreas. Glucagon: Glucagon is secreted by the green color α islet cells of the pancreas. Insulin: Insulin becomes active when the blood glucose level is high. Glucagon: Glucagon becomes active when the blood glucose level is low. Insulin: Insulin stimulates the uptake of glucose and amino acids into the cells. Glucagon: Glucagon stimulates the release of fatty acids from the triglycerides, which are stored in the body. Insulin: Insulin stimulates the synthesis of glycogen by increasing glucose uptake by the liver. Glucagon: Glucagon stimulates glycogenolysis and release of glucose from the liver. Insulin: Insulin stimulates the synthesis of triglycerides from free fatty acids. Glucagon: Glucagon stimulates the release of fatty acids from the triglycerides. Glucagon: Glucagon stimulates gluconeogenesis and release of glucose from the liver. Insulin: Insulin stimulates the uptake and storage of glucose in skeletal muscles. Glucagon: Glucagon has no effect on skeletal muscles. Insulin: Insulin stimulates the uptake of amino acids by body cells. Glucagon: Glucagon has no effect on amino acids. Insulin: Insulin reduces hunger by regulating the hypothalamus. Glucagon: Glucagon has no effect on the hypothalamus. Insulin: Insulin deficiency causes type 1 and type 2 diabetes. Glucagon: Glucagon deficiency causes hypoglycemia and glucagonoma. Insulin and glucagon are two hormones that regulate the levels of glucose in the blood. Both insulin and glucagon are secreted by different types of cells in the pancreas. Insulin decreases blood glucose levels and glucagon increases glucose in the blood. The main difference between insulin and glucose is the influence of each hormone on the concentration of glucose in the blood. 1. “What is Insulin?” EndocrineWeb, Available here. 2. Ogbru, PharmD Omudhome. “Glucagon: Function, Side Effects & Dosage.” MedicineNet, Available here. 3. “Normal Regulation of Blood Glucose.” EndocrineWeb, Available here.